D. M. Aderibigbe is a Nigerian poet, studying in the United States. His poetry is Nigerian in so many ways. Poems are intensely moored in the Nigerian culture, the Nigerian family life, and the Nigerian colonial experiences. Poems, though written in English, are on occasion festooned with the words of native languages, perhaps Yoruba, a language spoken by nearly 30 million people in West Africa. Yet the poetry he writes carries universal appeal. How the End First Showed chronicles strings of domestic relations. Each poem is a short story of a family—a unique and dysfunctional family—that comes across as a true story told with disarming simplicity. Mother, grandmother, daughter, sister, sister’s boyfriend, father, stepfather, son, brother, cousin, and every now and then an aunt, all appear in poems to animate the stories. All the poems are skillfully finished, but not the stories within the poems. Some stories are unfinished, some partly-finished, and some beyond-finished with drifting memories. But Aderibigbe adds a rebellious element to the Wordsworthian intuition. Aderibigbe extracts the child from fatherhood “and I’ll rewrite my childhood. /Amputating my father’s hands and legs with ink, like rebels/ chop innocuous civilians. By god. // my childhood will lack nothing. / Nothing at all.” This resolve to delete hurtful memories empowers the child to seek liberation from a flawed childhood. The poems showcase abuse, neglect, and violence practiced in households. Women are physically and emotionally abused. Children are deserted and drowned. Male violence permeates poems that in full honesty hide nothing. The forced subordination of women is a human-wide story as is the neglect of children. Male aggression is a phenomenon without borders. If this were not the case, there would have been no need to make specific human rights treaties for the protection of women and children. So as a social critic, Aderibigbe is right on track. By showcasing cruelty in households, Aderibigbe airs no intentions to malign a culture or a nation or a continent. He may have drawn his themes from specific experiences or observations; and, the imagery may be local, but the themes are universal. Specificity renders credibility to poetic observations, but the inferences remain non-local. Fortunately, the sadness of the Aderibigbe poems is bearable though, at times, the stories are terrifying. The reader may share sorrow but does not walk away from the book. Aderibigbe writes in simple English, using common words, the words that every English-speaking reader has experienced through emotions. There is no pretension, no verbosity, no need to consult a dictionary. The words flow with ease, line after line, poem after poem. “You were a caricature/of yourself—drawn with tears—/ when you stood at the door, asking/me how it happened.” This is verbal effortlessness at its best. The imagery in the poems is also simple, matter-of-fact, plucked from the physical and human world. “I stood by the roadside like a tree.” “My childhood was packed into many/travel bags.” “The laces of his only footwear/never loosened.” Simple images make the lines genial and they enter the reader’s imagination without resistance. 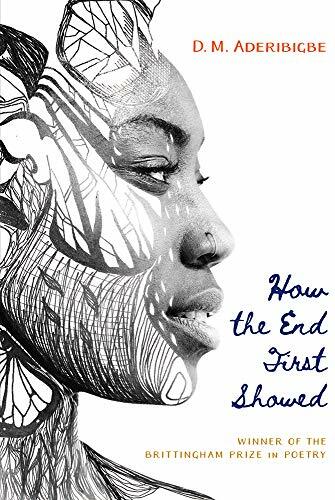 How the End First Showed is not merely a collection of Nigerian poems, it is an effort to forge transnational literature. For centuries, despite trade wars, goods and products have been imported and exported. And despite barriers, people have been immigrating across borders to enrich and challenge the customs and cultures of otherwise encapsulated populations. Poetry too is migrating, breaking out of its national borders. This cross-pollination of poetic traditions is not anything but a good development for world literature.